Washington, DC – Twelve finalists have been selected to pitch their pediatric medical device innovation during the National Capital Consortium for Pediatric Device Innovation’s (NCC-PDI) competition at the fourth annual Pediatric Surgical Innovation Symposium on Saturday, Oct. 8 hosted by the Sheikh Zayed Institute for Pediatric Surgical Innovation at Children’s National Health System. Up to six innovations will be awarded up to $50,000 each, with awards based on presentations given before a panel of expert judges. Each finalist will have five minutes to present their proposal to the judging panel, which includes Susan Alpert, MD, a pediatrician and former Director of the Food and Drug Administration (FDA) Office of Device Evaluation and former Senior Vice President and Chief Regulatory Officer of Medtronic; Noelle Dubiansky, of the law firmGoodwin; Julia Finkel, MD, of Children’s National Health System and founder of AlgometRx, a medical device startup in Washington, DC; Rick Greenwald, PhD, ofSimbex; Peyvand Khaleghian, PhD, of Avicenna Partners in Dubai; Matt Maltese, PhD, of The Children’s Hospital of Philadelphia; Eric Sugalski of Smithwise; and Tiffany Wilson of the Global Center for Medical Innovation. The format includes a five-minute question-and-answer period following each oral presentation. The “Make Your Medical Device Pitch for Kids!” competition, funded by the FDA through NCC-PDI, is a part of the Sheikh Zayed Institute’s fourth annual Pediatric Surgical Innovation Symposium, “Helping Kids and the Economy Grow Stronger Through Innovation,” on Saturday, Oct. 8, 2016 at the Marriott Wardman Park in Washington, DC. The one-day conference and Medtech innovation showcase will bring together innovators, investors, patient advocates, children’s hospital executives, local economic development strategists, and policy makers, including key leaders from the FDA, to stimulate pediatric device innovation and bring solutions to market faster. The opening keynote speaker is Brian T. Kenner, Deputy Mayor for Planning and Economic Development for the District of Columbia, who will speak to the role local economic development groups can play in creating ecosystems to promote innovation in science and technology. For the symposium agenda and registration, visit www.pediatric-surgery-symposium.org. The Sheikh Zayed Institute’s Pain Medicine Care Complex is one of only a few programs in the country focused exclusively on managing pain for infants, children, and teens. When children are unable to express their pain in words, our pediatric specialists have the unique insight to help. The Pediatric Anesthesiology Fellowship is affiliated with George Washington University in Washington, DC. 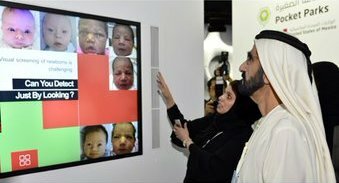 The Sheikh Zayed Institute for Pediatric Surgical Innovation was made possible through a $150 million gift from the government of Abu Dhabi. Julie Finkel, MD, and her team at the Sheikh Zayed Institute for Pediatric Surgical Innovation are working to develop devices and alternate ways to help understand and measure pain in children who can't express their discomfort. Dr. Finkel spoke to the Atlantic about pain medicine.